Holy D*mm it Christmas is this game fun! 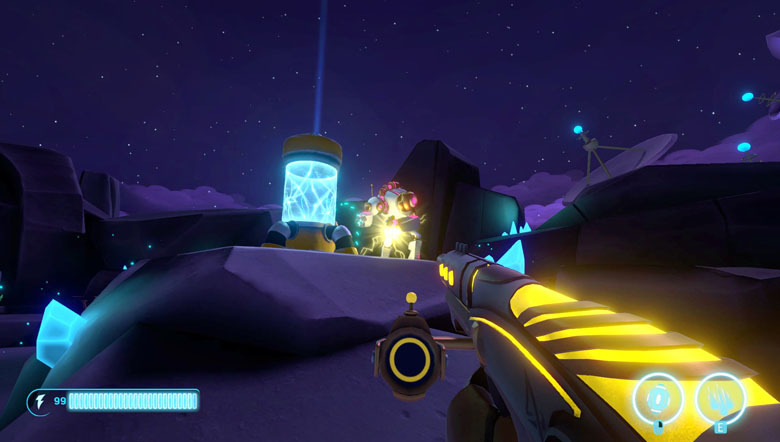 The basic plot puts you on Dusk 11, a planet rich in an energy source known as “Quanta.” The corporation known as Aftercharge has landed on Dusk 11 to mine said energy. Dusk 11 has shown some level of self-awareness, however: Quanta has been flowing in to decommissioned robots, reactivating them to destroy energy extractors. Aftercharge was determined to get the Quanta, so they called in their security detail to deal with the defuncted machines. You join a three-player team that attacks or defends. Depending which side you’re playing, your task is to either destroy all extractors or take out those who try. The revived robots are known as “workonics.” Their function is to destroy all the extractors on a map before their team is taken down. They carry no weapons, save fist, are invisible until they attack, and have unique abilities based on one of the three classes you opted to play. At first, I was a little confused about the objective, and just kept punching the enemy. Punches don’t deal damage; however, they do knock back a considerable distance. Team work is key as a workonic, you work in tandem to push away the enemy while destroying extractors, reviving fallen partners, and feeding energy to others which is then used to activate abilities. Once I got the hang of it, I ended up preferring it over the security team. A.K.A The Enforcers. The "enforcers" are the team of gunman hired by Aftercharge to protect the extractors while they collect Quanta. Like the workonics each have their own unique ability, but that is where similarities end. For starters, enforcers cannot be taken down. Once they run out of power, they no longer shoot or use abilities, forcing them to go to an extractor to recharge. They also carry a radar, which reacts when stealthed workonics are nearby. In Aftercharge weapons aren’t a right but a privilege, and playing as a workonic feels more difficult than in your average online shooter. To destroy an unguarded extractor, I often found myself sneaking up behind enemies, punching them away from fallen teammates. A fallen workonic is an enforcer’s opportunity to lure enemy players into a trap. Strategy done right, it can be disarming for the other team when a workonic falls in a strategic position. In one of my online encounters specifically, for example, our team of Enforcers ended up picking on a player throughout the match because once trapped and taken down, its side faced a wall and the opening to rescue him grew narrow. We kept a shield up to block the entry point, and the rest was glorious pawning. Bottomline: I can’t wait for Aftercharge to come out. The people at Chainawesome Games seem focused on quality game design, and it shows in the demo I played. This is Brandon saying thanks for reading.